A great many of the plants in my garden were not ones I chose. They came to be in my garden because I couldn’t stand the idea of them being discarded. Last summer some folks were working on a house on my street and I was stunned to see them use a mini-bulldozer looking machine to get rid of an iris bed that had been there for years! I felt sick to see it, and wondered why they hadn’t let people come dig bulbs instead. It just seems senseless to me to plow beauty under when it could just as easily be relocated. Luckily, my friends generally share the sentiment — and often their plants! One friend knew of a house that was recently sold that had lots of flower beds the new owners didn’t want to maintain. She got us permission to go and dig as much as we wanted. 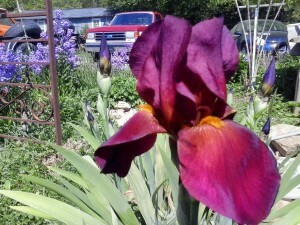 This was in the fall so we were digging iris and lilies with no idea at all what they would look like. Last summer, when we built my pond and tripled (!) the size of my garden, I planted most of the unknowns we rescued around the pond. The lilies bloomed last year and were yellow. Since I didn’t have any yellow lilies (just the regular, native orange day lilies) I was delighted. 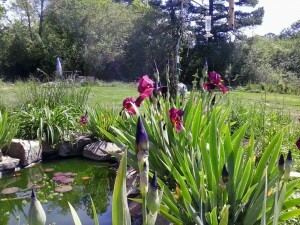 The iris didn’t bloom until this year. At first, I didn’t think they were going to bloom. The fans were thick and lush and green, but most of my other irises bloomed out before I spotted a bud on the mystery plants. Then, I thought they were going to be purple. At that point, every single plant that had bloomed in my garden had a purple flower. 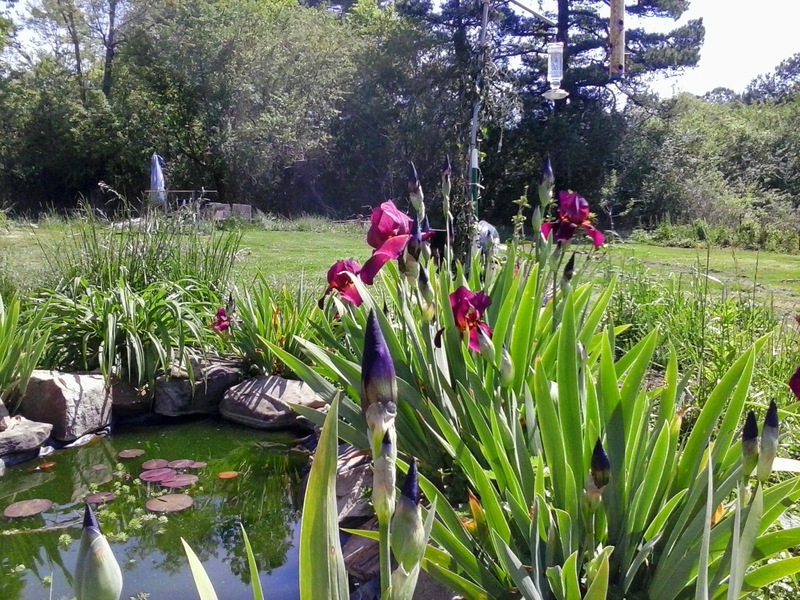 Several varieties of iris. English wallflower. I’d been hoping for some yellow or white. It was exciting! They weren’t purple! They were big and beautiful. And, it turned out they were also prolific. Most stalks had 2-5 blooms each. Even better, they bloomed for about a month! Most of my other varieties only bloomed for a couple of weeks. It was so exciting to watch for a bloom every day and then enjoy the flowers. I even cut a bouquet of them for a friend. Do you rescue plants without having any idea what they will look like?